The Asset Grouping feature of FaciliWorks 8i Enterprise Web-based CMMS Software proves to be an invaluable tool to national, international and global companies, allowing the partitioning of a single database for maintenance management across multiple sites. FaciliWorks CMMS allows for maintenance management of multiple sites within a single database. CyberMetrics Corporation is proud to announce a marked uptick in multi-location deployment of FaciliWorks 8i Enterprise CMMS software due in part to the flexibility and scalability offered by the Asset Grouping feature. Asset Grouping allows for the management of multiple sites’ maintenance within one database; the database can be partitioned by location, department or any other criteria. Limiting user access to a single group of site-specific assets improves efficiency and record security while still allowing full access to managers. “FaciliWorks 8i Enterprise CMMS is unique in that Asset Grouping allows for all asset management, preventative maintenance and even service request automation to be managed centrally with a single installation,” says Tim Miller, Director of Operations - CyberMetrics AMD Division. “Asset Grouping is a basic requirement for more and more national, international and even global Enterprise Asset Management efforts. This increase has been seen specifically within medical device, pharmaceutical, manufacturing and other FDA-regulated vertical markets,” Miller explains. FaciliWorks 8i Enterprise CMMS clients rely on the Asset Grouping feature to increase efficiency and provide transparency to management while still allowing for segmentation of their maintenance operations by location, type or function. 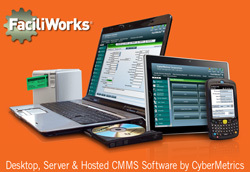 View FaciliWorks 8i CMMS Software videos. Founded in 1988, CyberMetrics Corporation is a world leader in scalable calibration management and CMMS maintenance management software solutions that are easy to implement, manage and use. FaciliWorks CMMS is a CyberMetrics flagship product primarily used by manufacturers within the consumer products, aerospace, automotive and energy industries, yet also serves the specialty needs of the pharmaceutical, medical device and health care industries with its 21 CFR Part 11 compliance and JCAHO requirement support. CyberMetrics Corporation is privately held and serves more than 12,000 customers worldwide including hundreds of Fortune 1000 clients. Download this FaciliWorks CMMS Software Press ReleaseCyberMetrics Corporation is proud to announce a 26% increase in multi-location deployment of FaciliWorks 8i Enterprise Web-based CMMS Software Brochure - FaciliWorks 8i Web-based CMMS SoftwareFaciliWorks 8i CMMS Software is scalable, centrally managed and conveniently accessible through your Web browser.